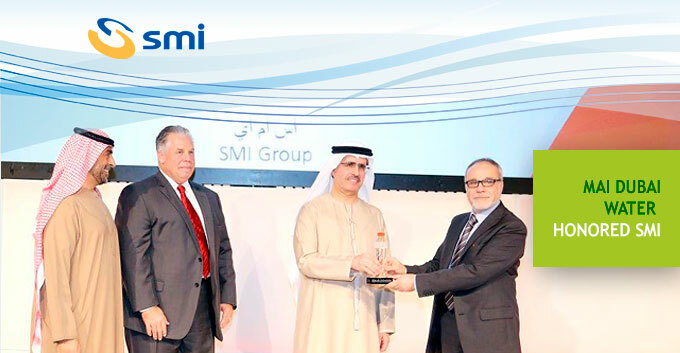 On January 12, 2016 Mai Dubai LLC, one of the largest water bottlers in the UAE, organized a ceremony to award their strategic partners, among which SMI stood out for the manufacture & installation of the company's new production plants. The exclusive location of the Armani Hotel at Dubai's Burj Khalifa (the tallest skyscraper in the world), hosted His Excellency Saeed Mohammed Al Tayer, CEO & Managing Director of DEWA (Dubai Electricity and Water authority, fostering the establishment of Mai Dubai LLC), Mr. Saeed Bin Ghannam, Mai Dubai LLC Director of Operations, and Mr Jay Andres, COO of Mai Dubai LLC, beyond several local governamental organizations, private companies, media and press officers. In a press note, Mr. Jay Andres welcomed the participants: "Similar to most companies, our keys to success revolve around our relationships with our customers, our suppliers and our own employees" - "We are fully aware that we are not just a water bottling plant. Our company represents Dubai. This is an important responsibility that we take very seriously and consider in all of our decision-making." - added the COO. 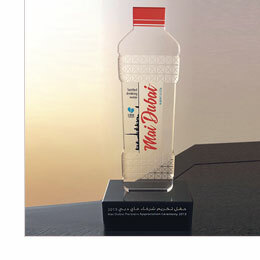 Since going operational with distribution in April of 2014, the company has delivered over 163 million single servings of Mai Dubai water, exported to 13 countries in the Persian Gulf region, thanks to the high efficiency level of the production plants supplied by SMI and to the modern bottling and packaging technologies employed. The prize awarded to SMI was collected by Mr. Pierre Anid, General Manager of Novadim Food Technology and agent for SMI in the UAE, who gave an important contribution to the success of this supply.